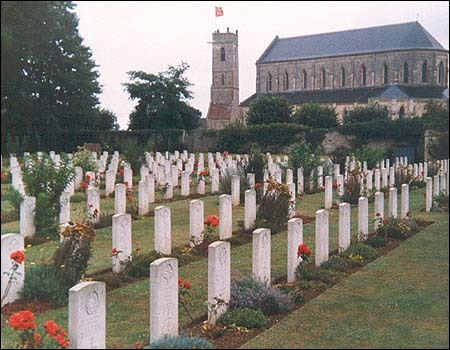 Ranville War Cemetery (7 miles north-east of Caen) lies next to the village churchyard. A great many of the graves are men of the 6th Airborne Division, who were landed by glider or parachute nearby to take vital bridges over the Orne and Caen Canal. It was the first village to be liberated in France, when the bridge over the Caen Canal was captured intact in the early hours of 6th June 1944 by troops of the Airbourne Division. Of a total of 2,566 burials, a special memorial is erected to a British soldier who is known to be buried here, but whose grave could not be found. It bears the sad inscription, "Known To Be Buried In This Cemetery." This is the most beautiful and well kept cemetery I have ever visited, but don't expect the locals to like you. They absolutely hate the British and my time visiting the cemetery was made very unpleasant by some of them. Some shops just refused to serve you, once they knew you were English.